Flush & Semi Flush Lights at Thompsons Lighting & Interiors, Larne, Co. Antrim, Northern Ireland. 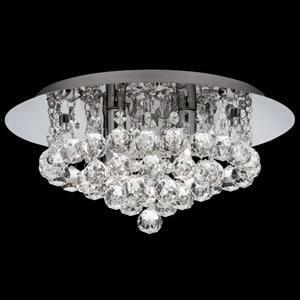 Flush Lighting online & in-store. Delivery throughout the UK. 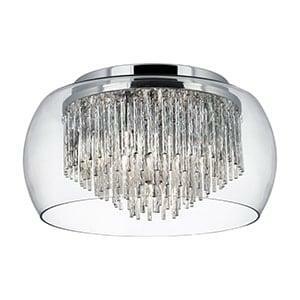 This Sculptured Ice Chrome 6 Light Curved Semi-Flush with Clear Shaped Glass is ultra-modern and stylish. The fitting has a circular ceiling plate finished in chrome and two curved arms leading to the six diamond shaped glass shades. And it provides a practical source of light for any contemporary bedroom, living room, dining room or kitchen ceiling. 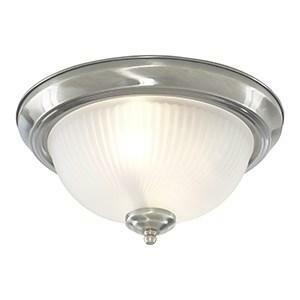 This American Diner satin chrome light looks beautiful on any ceiling, with simplicity and style inspired by the era of the classic American Diner. 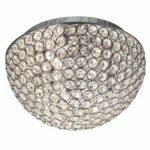 The acid ribbed glass diffuser provides clean lighting effects, which are perfect for your kitchen or bathroom, and the matching metal trim finished in chrome completes the look. The Beatrix chrome 5 light fitting with crystal drops and aluminium twist tubes is the perfect centrepiece for any bedroom, living room, dining room or kitchen. 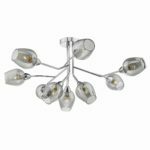 The five lights are intricately positioned within the elegant crystal drops and diamond cut twisted glass cylinders, creating a fabulous lighting effect and a look of sheer opulence. 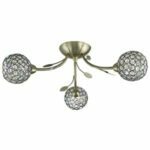 This Bellis II antique brass 5 light fitting with clear glass shades and leaf decoration looks beautiful on any bedroom, living room, dining room or kitchen ceiling. 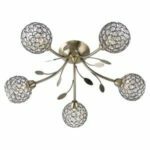 The ornate antique brass finish fitting features five elegantly crafted flower head spheres, made from antique brass finish hoops and clear glass buttons, which look stunning and create a fabulous lighting effect. 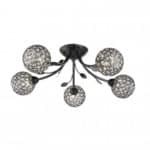 This Bellis II black chrome 5 light fitting with clear glass shades and leaf decoration looks beautiful on any bedroom, living room, dining room or kitchen ceiling. 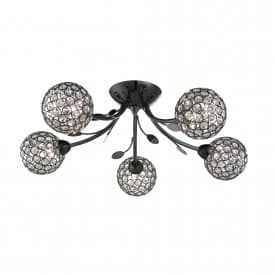 The ornate black chrome finish fitting features five elegantly crafted flower head spheres, made from black chrome finish hoops and clear glass buttons, which look stunning and create a fabulous lighting effect. 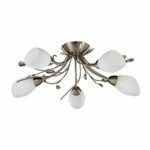 This Bellis II chrome 3 light fitting with clear glass shades and leaf decoration looks attractive on any bedroom, living room, dining room or kitchen ceiling. 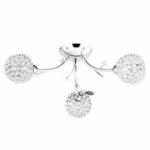 The ornate chrome finish fitting features three beautifully crafted flower head spheres, made from intricate chrome finish hoops and clear glass buttons, which look elegant and create a stunning lighting effect. 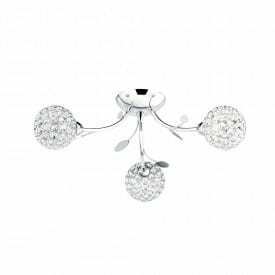 This Bellis II chrome 5 light fitting with clear glass shades and leaf decoration looks beautiful on any bedroom, living room, dining room or kitchen ceiling. 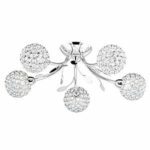 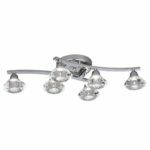 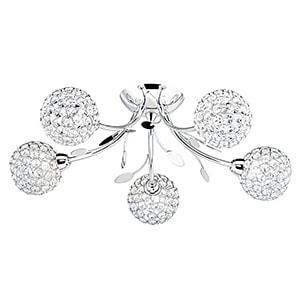 The ornate chrome finish fitting features five elegantly crafted flower head spheres, made from chrome finish hoops and clear glass buttons, which look stunning and create a fabulous lighting effect. The Curva clear glass shade 4 light ceiling fitting with aluminium spiral tubes fits flush to the ceiling and looks stunning positioned in any room in the home. 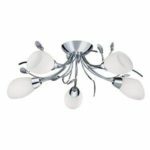 The modern design and ornate tubes create a unique look, with a stylish chrome, aluminium and glass finish, and the four lights illuminate the entire room. 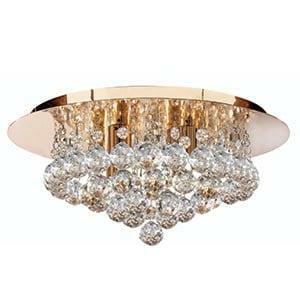 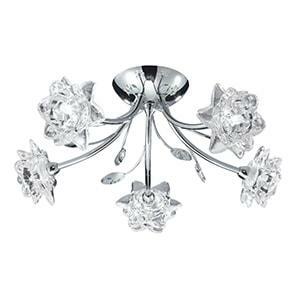 This Gardenia Chrome 5 Light Semi-Flush with Crystal Detail and Opal Glass Shades looks elegant any ceiling. 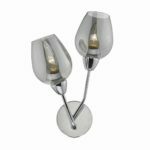 The intricate fitting features delicate cut glass decoration and five cone shaped opal glass shades, in the shape of flowers, with a modern chrome finish. 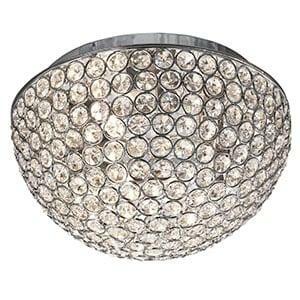 And it provides a gentle source of light for your bedroom, living room, dining room or kitchen. 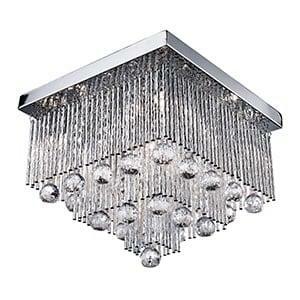 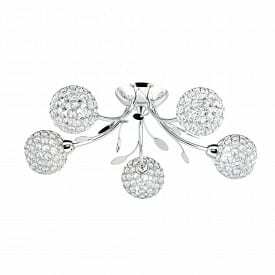 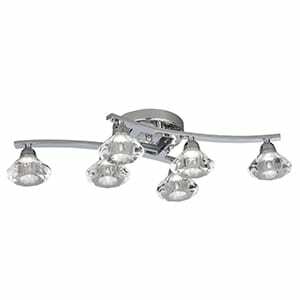 This Hanna Chrome 4 Light Ceiling Fitting with Clear Crystal Balls looks stunning on any ceiling. 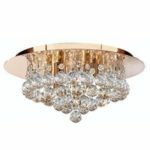 The luxurious light fits flush to the ceiling and features four lamps surrounded by decadent crystal trimmings and balls. And the elegant mirrored backplate completes the look of this contemporary chandelier.